Bringing a host of impressive features and functionalities, the MA-708 is an undisputed market leader in its class. MA-708 delivers unparalleled audio performance and craftsmanship. The rugged one-piece speaker cabinet houses a high efficient class-D amplifier that drives high sensitivity two-way loudspeakers and limiter circuitry reduces distortion and increases intelligibility for guaranteed powerful and clear sound. It offers an ideal public address solution for medium to large crowds. MA708PAB Portable PA with Bluetooth .Includes cord mic. The MA708 comprises a 120-watt amplifier driving an 8” woofer and a 1” compression driver. The combination of high output and a true 2-way speaker system makes the MA708 perfect for performance and music applications. The amplifier is a high-efficiency class-D providing up to 7 hours of continuous use from the integrated battery system. Three models are available and these can be optioned as required. The base unit includes a cord mic whilst the top of the range include a CD player and wireless mic receiver. The MA708 incorporates some of the most popular features of the larger MA808, including the ability to support up to four wireless receiver modules, a rear panel “fuel-gauge” for battery status, an optional wireless interlinking module, plus a switchable “voice-priority” feature. 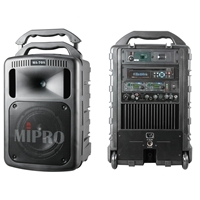 The MA708 is perfect for schools, corporate multimedia presentations, trade shows, auctions, funeral services, weddings, shopping centre presentations, special events, lectures, political campaigns, etc. Lightweight Class D amplifier produces 190-watt peak audio output. 3 power modes: AC, rechargeable battery & DC jack. For crowds up to 1,000. Built-in storage compartment for 2 transmitters. Up to 4 optional high performance diversity receiver modules with 16 auto-scanable frequencies. transmission range and expand coverage. Innovative digital master volume control enables volume loudness be manually or remotely controlled by an optional MIPRO 3Ha handheld transmitter microphone instead of a separate remote. Echo control on wireless mics. Line-output for external audio recordings. 4-segment battery meter for accurate battery reading and charging status. Suitable for tripod, floor or desk mount. Dimensions (W × H × D) 336 × 545 × 325 mm | 13.2 × 21.5 × 12.8 "